JEDDAH, 5 June 2003 — Saudi Arabia’s leading executioner Muhammad Saad Al-Beshi will behead up to seven people in a day. “It doesn’t matter to me: Two, four, 10 — As long as I’m doing God’s will, it doesn’t matter how many people I execute,” he told Okaz newspaper in an interview. He started at a prison in Taif, where his job was to handcuff and blindfold the prisoners before their execution. “Because of this background, I developed a desire to be an executioner,” he says. His first job came in 1998 in Jeddah. “The criminal was tied and blindfolded. With one stroke of the sword I severed his head. It rolled meters away.” Of course he was nervous, then, he says, as many people were watching, but now stage fright is a thing of the past. He says he is calm at work because he is doing God’s work. “But there are many people who faint when they witness an execution. I don’t know why they come and watch if they don’t have the stomach for it. “Me? I sleep very well,” he adds. Al-Beshi will not reveal how much he gets paid per execution as this is a confidential agreement with the government. But he insists that the reward is not important. “I am very proud to do God’s work,” he reiterates. However, he does reveal that a sword will cost something in the region of SR20,000. “It’s a gift from the government. I look after it and sharpen it once in a while, and I make sure to clean it of bloodstains. By the time the victims reach the execution square they have surrendered themselves to death, he says, though they may hope to be forgiven at the last minute. “Their hearts and minds are taken up with reciting the Shahada.” The only conversation with the prisoner is when he tells him to say the Shahada. There is no great difference between executing men and women, except that the women wear hijab, and nobody is allowed near them except Al-Beshi himself when the time for execution comes. When executing women he will use either gun or sword. “It depends what they ask me to use. Sometimes they ask me to use a sword and sometimes a gun. But most of the time I use the sword,” he adds. 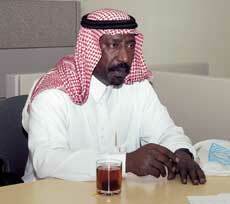 As an experienced executioner, 42-year-old Al-Beshi is entrusted with the task of training the young. “I successfully trained my son Musaed, 22, as an executioner and he was approved and chosen,” he says proudly. Training focuses on the way to hold the sword and where to hit, and is mostly through observing the executioner at work. A father of seven, he is a proud grandfather already. “I have a married daughter who has a son. He is called Haza, and he’s my pride and joy. And then there are my sons. The oldest one is Saad, and of course there is Musaed, who’ll be the next executioner,” he adds.